Your Best Unleaded Petrol Choice! E10 Unleaded Petrol will improve engine performance when you switch from Regular Unleaded Petrol. E10 Unleaded Petrol burns more completely in your engine which reduces harmful emissions and is better for the air you breathe. Today’s cars are not just compatible with E10 Unleaded Petrol, they’re actually built to run on it. Our E10 Unleaded Petrol is made right here in Queensland with ethanol from the United Dalby Bio-Refinery. Ethanol is a pure fuel grade alcohol that is added at 10% to improve Unleaded Petrol. Ethanol is 1/3 oxygen which improves the octane from 91 to 95, and ensures the fuel is burnt more completely. This improves engine performance, cleans your fuel system and massively reduces harmful exhaust emissions. Who can use E10 Unleaded Petrol? Today’s cars are not just compatible with E10 Unleaded Petrol, they’re actually built to run on it, allowing you to replace your regular or premium unleaded petrol with E10 Unleaded Petrol when you fill up. It’s ok to switch back and forth between E10 Unleaded Petrol and all other unleaded fuel types. E10 Unleaded Petrol has a 95 Octane Rating which is much higher than regular unleaded petrol which has only a 91 rating. This difference translates to more dynamic and smooth engine performance which you will feel on the road. Fuelling with E10 Unleaded Petrol also will help to keep your whole fuel system clean as ethanol is a natural cleaning agent, eliminating the need for expensive fuel additive packages. 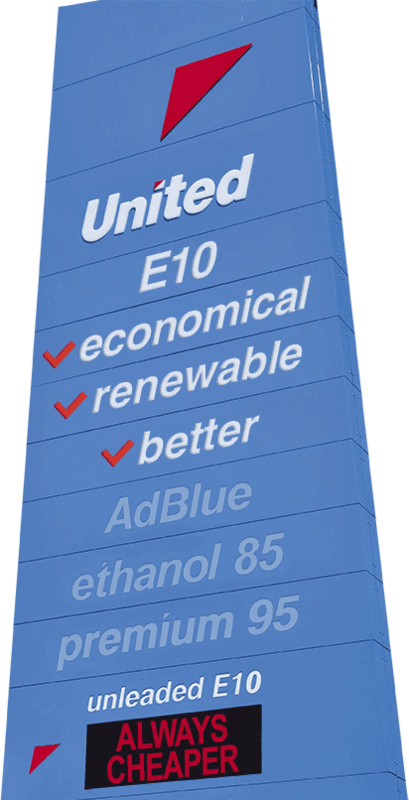 Why switch to United E10 Unleaded Petrol? We know that your vehicle’s performance and protection is very important, which is why we pledge that our fuel products, including our E10 Unleaded Petrol, are backed up with the United Petroleum Quality Guarantee. United’s fuels are of the highest quality and sourced from local and overseas refineries, following strict quality testing regimes. Our fuels meet and exceed all the requirements of the Australian National Fuels Quality Standards and consumers can buy from United with absolute confidence. USA, UK, Canada, Japan, China, South Korea, Germany, Italy, Angola, Argentina, Austria, Belgium, Brazil, Bulgaria, Chile, Columbia, Costa Rica, Croatia, Cyprus, Czech Republic, Denmark, Estonia, Ethiopia, Fiji, Finland, France, Greece, Hungary, India, Indonesia, Ireland, Jamaica, Kenya, Latvia, Lithuania, Luxembourg, Malaysia, Malawi, Malta, Mexico, Mozambique, Netherlands, Nigeria, Norway, Panama, Paraguay, Peru, Phillippines, Poland, Portugal, Romania, Slovakia, Slovenia, South Africa, Spain, Sudan, Sweden, Thailand, Turkey, Uganda, Uruguay, Vietnam, Zambia and Zimbabwe.